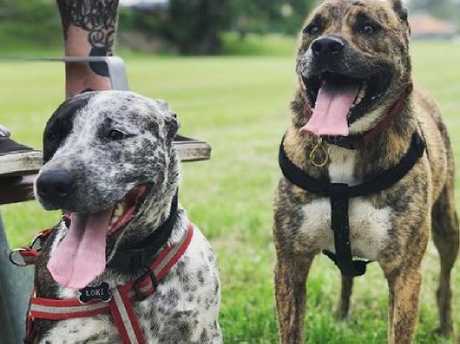 TWO dogs that suffered life-threatening injuries are believed to have been thrown off a 10m high bridge. 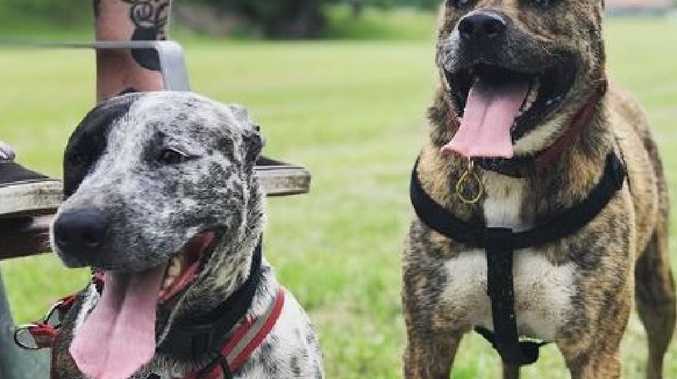 The two males - Taco, a staffy-cross-bull terrier; and Loki, a staffy-cross-blue heeler - had either escaped or were released from the yard of their Nerang home and were spotted near the M1 by motorists about 5pm on Tuesday. 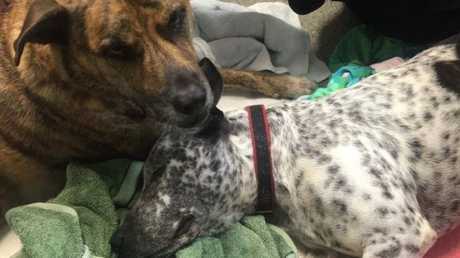 Taco (brown) and Loki (black and white) are recovering in hospital after they were believed to have been thrown from a 10m high bridge. Shortly after 5pm, a couple driving under the Pappas Way overpass saw both dogs fall about 10m from the bridge. The injured dogs were later found and taken to Greencross Vets, Nerang. Local Petbarn supervisor Jeremy Marshall said he spoke to the couple who saw the dogs fall. 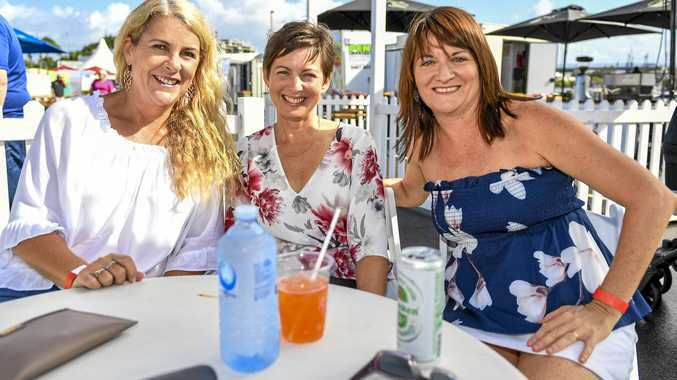 "He said it looked like a handbag had been thrown off the bridge, but then a second one fell," Mr Marshall said. "It was the way they had fallen which made them think they were thrown." 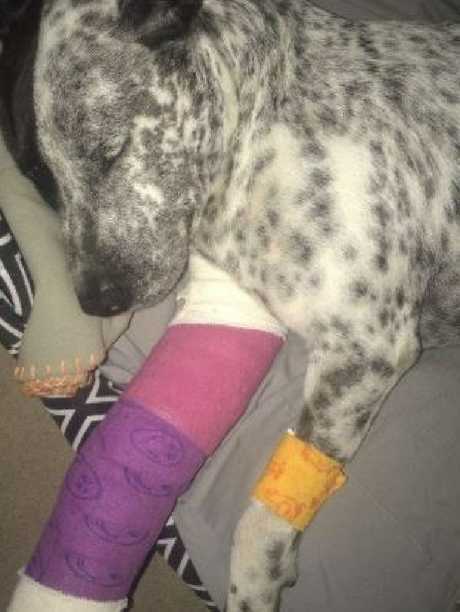 Loki had two broken legs after it was believed he was thrown 10m from a bridge. Three-year-old Loki has two broken legs and internal bleeding that required urgent surgery. 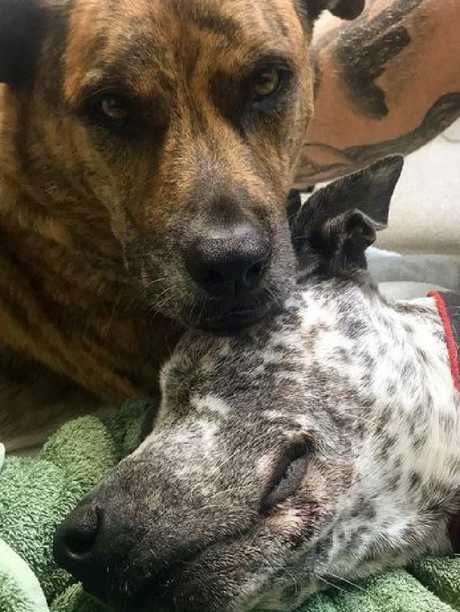 Taco, also three, has a broken jaw, shattered teeth and internal bleeding. Their owners, Chelsie Lamb and partner Clint Jackman, said the overpass had a 1.5m pedestrian barrier. The dogs had never escaped before and they feared someone took them or let them out the side gate. The pair have spent $4000 on vet fees. A GoFundMe page was set up to help cover bills amounting to more than $8000. Police have been contacted. The dogs are recovering.